Faith Christian’s Madi Snow signs her scholarship to attend Judson College for softball. When Madi Snow transferred to Faith Christian last year and wasn’t able to play her important junior high school season she worried a little that the break might impact her shot at playing college softball. 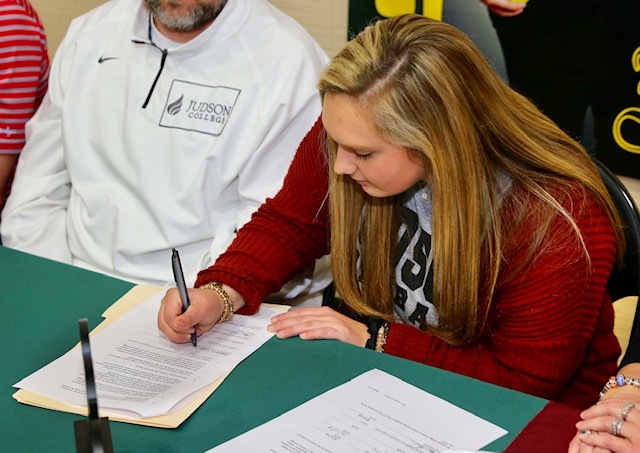 Early on, she was just about resigned to the idea of going to Gadsden State and then transferring to Alabama for academics, her developmental years in softball just a happy memory. But on Monday morning, in front of her team and classmates, the senior third baseman signed to play for Judson College, where coach Tom Hannah anticipates her flourishing for the next four years. “I wanted to play softball in college, but it just kind of wasn’t working out,” she said. “I started thinking about Judson and everything kind of fell into place like it was meant to be. The tryout wasn’t easy. The weather and field conditions that day in the fall forced the prospects to hit in the indoor cage at nearby Marion Military Institute and then move back to Judson’s quad for fielding work. It didn’t dissuade Hannah. He had two targets at the tryout, Snow was one of them, and the Eagles signed both. “I didn’t see her play high school ball or travel ball, but it didn’t one bit,” Hannah said. “We had her at a tryout and we worked her out and I knew immediately she had the kind of skills and was the kind of young lady that fits our program perfect. Actually, not playing last year after moving over from Alexandria made her a better prospect, first-year Faith coach Jason Campbell said. The weather has made it tough to get anything started, but Snow has delivered for the Lady Lions when she’s gotten the chance. She had two hits against Jacksonville and has three hits and three RBIs in four games so far this season. The Lady Lions already had postponed Monday’s game because of weather, but Snow is scheduled to take the field again Tuesday in the team’s area opener against Winterboro.